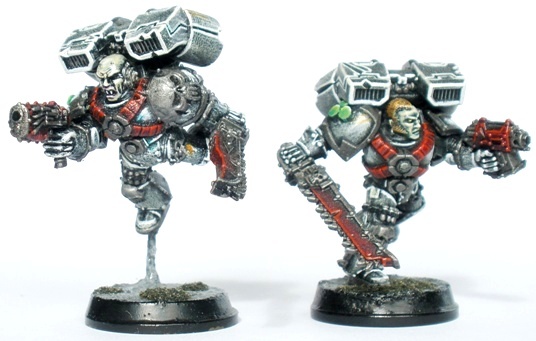 Squad Klaus was the first unit that I painted for my Sin Eaters, waaay back in 1999. 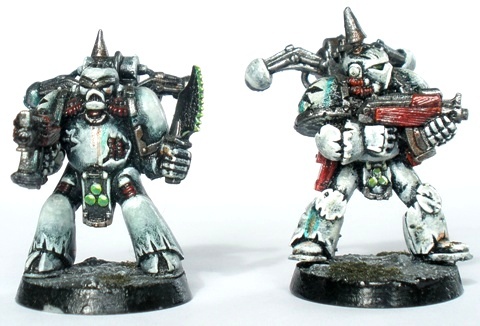 As the Sin Eaters was going to be an exclusively Nurgle Chaos Marine force I decided to start with two ten man Plague Marine units, the first of which was Squad Klaus. 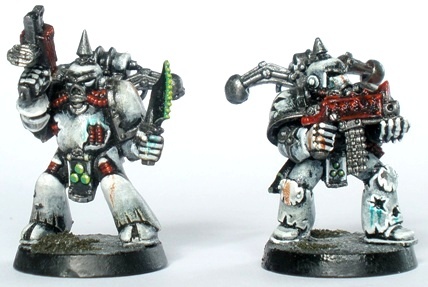 Squad Klaus is made up of plague marines with bolters. Half of the miniatures are the old plastic plague marine three piece plastics and the other five are old metal plague marines, including the original, very first ever plague marine model, Klaus himself. 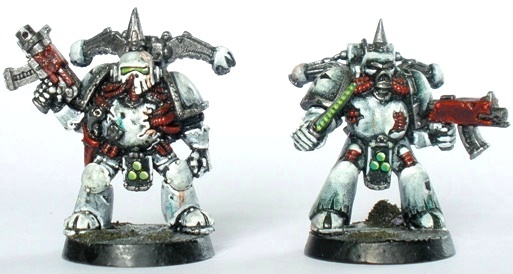 The all plastic plague marines are a lot cruder that the stuff that GW has made since. In the interests of keeping costs down I squeezed them in alongside the nicer metal figures. 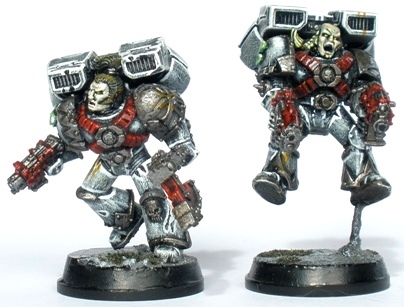 Like Squad Damien, I painted these guys a certain way. As time went on and I painted more and more Sin Eaters the techniques evolved a bit. 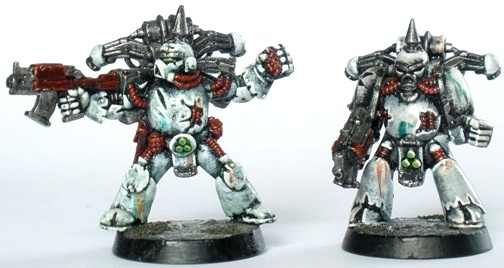 The figures still look like they are part of the same uniformed force, but the paint application techniques changed. 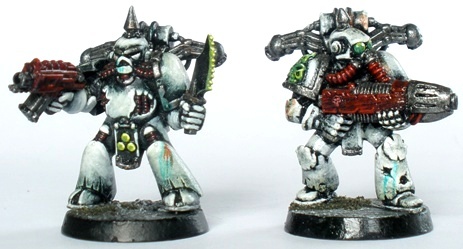 Compare the white armoured areas on the marines in Squad Nemesis with these guys and you should be able to see the difference. 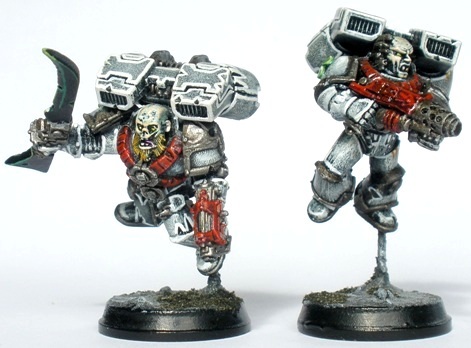 Squad Klaus hasnt had as much time on the tabletop as I would like, mostly because while carrying a bolter may be iconic in terms of the 40k-verse, in terms of gameplay it doesnt cut it (or it didnt when I used to play. I dont know what its like now really). I hope to remedy this with some skirmish games that feature Klaus and co at some point over the next year or two. 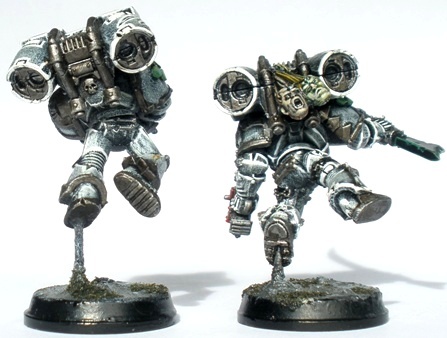 ...and the plastic Combat Squad 2.